We worked with local Amish craftsmen to redesign this outstanding hand rotary cultivator, which we've carried for years. It's still the easiest way to rid your garden of weeds - and now it's even better than ever! 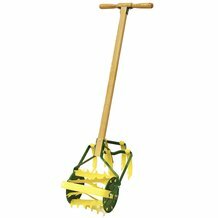 Add this hand-powered, efficient and old-fashioned garden tool to your garage or shed and be ready to be impressed. You never know, after reading reviews, if the product you think you are buying is in fact as good as you would like it to be. I was impressed with this product. My father had one just like this that he used for years. I had been looking for something like that one for a long time. THIS WAS IT. Strong. I have used it in this Texas clay type soil and I couldn't be happier. I am using it primarily to cut weeds just below the surface. I couldn't be more pleased. Well, I redrilled the holes on the handle and got the thing put together. I took it out in the garden to use it. I'm really surprised by the people who say it is easy to use. I tried pushing it with the cutting bar down to cut off the weeds. I simply cannot push it this way. I tried pushing it with the tines down to break up the soil. Again, I cannot do it. The only time I was able to get it through the dirt was when I tried going through dirt I had just turned over with a shovel to dig out onions and potatoes. I was able to get it through the dirt by pushing it in spurts with one foot kicking the bottom along. Incidentally, my soil is sandy, and was tilled a year and a half ago. Maybe I'm just not doing it right. I wouldn't know. The only instructions I have are what is written in the description on the web page. Nothing came with the tool. Wow. For this price I would have expected better, especially since it was made in North America! The product came in a box with nothing else in it. No packing slip. No instructions. The holes on the metal pieces do not line up. This has resulted in me having to drill bigger holes in the handle in order to get the bolts through, which will probably result in a sloppy handle when all is said and done. I would send it back but it cost me $40 in fees to get it across the border (Canadian sales tax plus broker fees). WOW! What a difference this has made in my garden. I was really worried that for the price it wouldn't be worth it but it is GREAT! I know it says that it won't work in clay, but we have very heavy adobe ground and it gets the weeds better than any other tool I have ever used. This has made a three day weeding job into a 30 minute job and it does a better job. Thanks! I have an old cultivator named Rowe Hoe. It is just about like the one's Lehman's sell, but old - these tools last forever. (I did have to put a new wooden handle in mine after 50 years.) Here's a trick my father-in-law showed me that I really like, to cover new seed rows. (He's 91, and still uses his, by the way.) This would work just the same with the new ones from Lehman's. The tine cultivator teeth aren't much use to me, as cultivators. But if you'll take out the center tine, the machine makes a PERFECT seed row covering tool. Make your furrow, plant your seeds, then run the cultivator over the row lightly, with the tine side down, and running with the center (missing) tine space straddling the row. The soil pushes over the seed row just perfectly! Actually, that is all I really use the cultivator tine side for. Nearly all the rest of the time, I run the blade side down. Keep the blade sharp, and keep the depth adjusted so that it only cuts just below the surface. It takes out weeds effortlessly. No harder to push than a grocery cart if you've got it set right.You'll love this little tool. Use it often, and enjoy a clean row - right up to the edge of the plants. Since it doesn't cut deep, you don't harm the wanted plants, but you do cut off the little weeds!I'm so very glad to see Lehman's making them again. Friends have bought them after seeing mine, and they love them, too. My rotary cultivator arrived and I stopped everything to put it together immediately. I've been longing for that baby ever since I first laid eyes on it last year in one of your catalogs. I'm in orbit with delight. I work out of my home as a researcher, writer and editor, but I'd much rather be in the garden. I keep a year round 4 thousand square foot vegetable garden, with only occasional help and it's spring planting time here in Central Virginia Zone 7. With the deep snows this past winter, we have only had one week since the last of the snow finally melted and the ground has even been dry enough to work. I'm about one month behind with ground preparation. 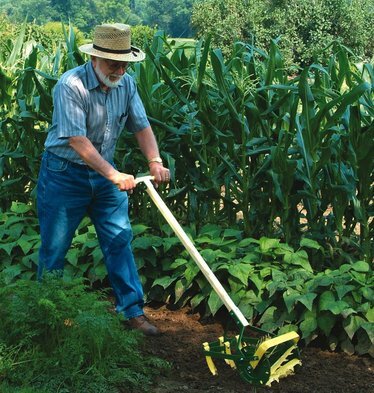 For the past ten years I've done all of the garden work, once the ground was initially broken, using only hand implement even though I'm not Amish. As a single female I realized years ago that I have no interest in maintaining small gasoline engines myself and my planting seasons are half over by the time a guy with a tiller shows up. Too much mechanized tilling ruins the soil anyway. Even though I don't have a very good selection of wrenches, the cultivator went together easily. It's a beautiful piece of craftsmanship, but I resisted the temptation of parking it in my living room. Even though I had just gotten cleaned up from transplanting, I went right back out in my office clothes and Bean boots running that baby up and down a new bed area. I was thrilled to do three beds in that test run in a fraction of the time that it takes me by hand to break just one of my three foot by twenty foot plots. Oh happiness. 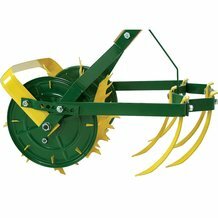 I would certainly recommend your company and this rotary cultivator to others. I can't wait to show it to everyone who stops by for produce this year. A gas tiller just cant work up a garden as fast as this thing can or make it look as nice. I use this between the rows and a high wheal cultivator across the rows and there is almost no hoeing. I have my garden done in less time then I can get a gas tiller out and started. Even my teenage son will stop his video games for a chance to push it through the garden ! he never did that with a gas tiller. infinitely superior [than a tiller] for cultivating. I can even break ground with it. Mine is easier, quieter, faster...it's better in every way! ...a wonderful piece of equipment!